Ever see the Harlem Globetrotters live? If not you and your family are in for a treat as they are returning to the greater Los Angeles area doing their thing at 4 different venues! 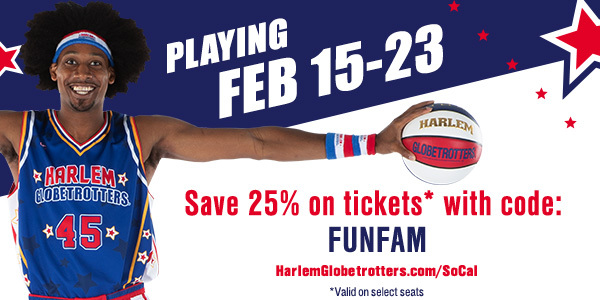 During each Globetrotters game, there will be more than 20 opportunities before, during, and after each event where fans will get a chance to directly interact with the team’s stars, that’s a 30-percent increase over any previous Globetrotters game. The Harlem Globetrotters roster showcases some of the most thrilling athletes in the world, including Big Easy Lofton, Ant Atkinson, Hi-Lite Bruton, Hammer Harrison, Thunder Law, Bull Bullard, Firefly Fisher and, Cheese Chisholm – plus female stars TNT Lister, Torch George and Hoops Green. An additional exciting new element fans can look forward to this year is a new interactive mobile app with exclusive features, including an augmented reality (AR) basketball toss game and one-of-a-kind image filters that can be shared on social media. Also back by popular demand, fans will also get a chance to see the Flying Globies, an amazing acrobatic trampoline dunk team that will defy gravity during breaks in the game action. *Walter Pyramid at Long Beach State University Friday, February 15 at 7pm. *Citizens Business Bank Arena in Ontario Saturday, February 16 at 2pm and 7pm. *STAPLES Center in Los Angeles Sunday, February 17 at 2pm. *Honda Center in Anaheim Saturday, February 23 at 2pm and 7pm. Enter below at a chance to win your way to the show! Winner will receive 4- Vouchers good for the February 23, 2019 game and can be redeemed for the 2pm OR 7pm show at the box office.